Unlike other gold and silver buyers, Used Jewelry Buyer LLC buys fine jewelry. We accept jewelry for purchase through the mail, but we do it differently than typical “cash for gold” buyers out there. We like to start by speaking with you personally on the phone — to see if it is really worth it for you to mail in your jewelry. Once it’s determined that you have valuable jewelry items to sell, and we’ve developed a mutual trust, you can follow the mail in instructions below. We post our gold and silver buying prices right on our website — just visit our home page www.usedjewelrybuyer.com to see what we’re paying today. Of course, we buy scrap gold and pay the highest prices — with our buying prices set at 80% to 85% of the intrinsic value. But, unlike other buyers, we pay you for your diamonds and value your other items as ‘resalable jewelry,’ not just scrap. This approach makes the price we pay very competitive for buying unwanted diamonds and jewelry. We also buy antique and estate jewelry in addition to all diamond jewelry, gold and silver bullion and coins. Used Jewelry Buyer LLC offers phone or online bids with specific information. If you have an appraisal from a jewelry store or a certificate from a gem lab such as G.I.A. or A.G.S. we can make you an approximate offer by email or by phone. If you have silver or gold all we need is the weight of the items and the karat of the gold. If you don’t know the weights you can buy a cheap digital scale at a local retail store (like Target). We believe in educating you on the value of your items before you sell. If you have coins, we need the type of coin, coin material (is it gold or silver,) and the dates on the face of the coin. Call T. Brian Hill at (314) 313-5804 with your information or email us a digital photo of your pieces with a detailed description including the appraisals and certificates at bhill@usedjewelrybuyer.com. With enough information we will be able to make you a reasonable cash offer for your valuable jewelry. Used Jewelry Buyer LLC is a small business with a staff of three. I do most of the work myself with the help of two part time employees. If you call our phone number or use our email you will be communicating directly with owner. We pride ourselves on customer service with honest evaluations and straight talk. I want to buy your used jewelry, and you want to sell it, so give me a call and I will be honored to help you. If I miss your call please leave your name and number and I will get with shortly. Include this item list and personal information form if you want to mail us your jewelry. You’ll need to fill out all personal information, along with a list of your jewelry items, on the printable form located here (PDF). Please read all the terms and conditions stated here, and if you agree and accept them sign your item list form. If we receive your form unsigned, Used Jewelry Buyer LLC accepts no liability for your items. Please keep a copy for yourself. If you have appraisals, diamond certificates, gem lab reports, receipts or any other information that would determine the sizes, qualities or types of stones in your jewelry please attach a copy with the item list. Don’t worry if you don’t have any documents it just helps speed up the process and cuts down on discrepancies. The ONLY way to properly insure your jewelry is through the United States Post Office. Mail your jewelry by registered mail with the insurance the Post Office provides. On your registered mail receipt there will be a declared value line to put in the insurance amount for your jewelry. When addressing your forms and box, DO NOT reference jewelry or Used Jewelry Buyer. Address all packages to T. Brian Hill. This provides your items with an extra level of security. Here is the kind of forms and package you will need as well as how to address them. If needed we can overnight you a shipping kit that includes the packaging and forms but you will still have to go to a local post office. Please call Brian Hill at (314) 313-5804 if you have any questions, need help, or would like a packaging kit provided to you. It is vitally important that you understand that online buyers who offer free shipping and send you FedEx or UPS labels also have disclaimers that they will only be liable for a maximum of $100, regardless of the value of your items. Please read the disclaimers and conditions. YOU WILL ONLY BE FULLY INSURED IF YOU BUY INSURANCE FROM THE POST OFFICE OR YOU HAVE ARRANGED INSURANCE WITH AN INDEPENDENT INSURANCE CARRIER. We are not responsible for any loss during shipping. When we accept delivery your jewelry will be insured for its replacement value or a maximum of $25,000.00. Used Jewelry Buyer LLC will reimburse your insurance and shipping charges if we purchase your jewelry. If we do not make a purchase from you we will pay the return mailing charges and the insurance at our expense. To send jewelry by U. S. Postal Service registered mail you must package your jewelry appropriately and per the U.S. Postal Service instructions. Most importantly, you must completely cover your package with paper packaging tape. According to the USPS' website, packaging "tape must visibly damage the mailing box if removed and must absorb the ink in a postmark impression," which is why all packages must be wrapped with "plain paper or cloth tape." Order a mailing kit from us if you do not have access to boxes and tape. Call Brian at (314) 313-5804 or email bhill@usedjewelrybuyer.com. Please include your name and address if requesting a kit by email. Pack your valuables carefully. We suggest wrapping the items in bubble wrap and filling the remainder of the box with Styrofoam peanuts. This should provide adequate protection for your valuables in shipment. Measure and cut tape to fit your box. Be sure to cover all sides and seams of your box. This assures your package is not tampered with in transit as there is no way to open the box without breaking the tape. 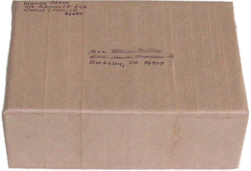 Write the recipient's mailing address and your return address directly on the package – right over the tape – using permanent ink. 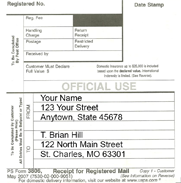 Remember to address your package to T. Brian Hill and NOT Used Jewelry Buyer. You do not want to advertise that you have valuables in this box. Do not use labels – labels can be removed or replaced and do not provide security for your valuables. Once you have your package together, go to your local postal office and tell the post person that you want to mail your package by insured registered mail. You will need to fill out a small form specifying your address, the recipients address (remember to use T. Brian Hill), and the insurance amount you want. The Post Office will stamp all the seams and thus insure that the package is not tampered with. 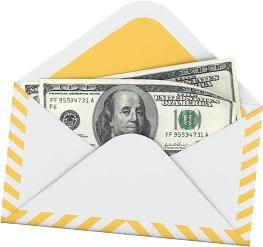 When mailing your jewelry please insure it for its replacement value. If we return your jewelry to you we will insure it for the same amount as when you sent it to us. Our offer to purchase will not reflect the insured or appraised value but in the event you do not want to sell your jewelry it should be insured for the proper amount in case of a claim with the United States Post Office. If you do not know the value or do not have replacement appraisals we can help you determine proper amount of insurance to purchase. Please call Brian Hill at (314) 313-5804 if you need help with the values. Used Jewelry Buyer LLC video records the opening of all inbound shipments and compares the contents with the item list you have provided. After recording the opening of your package we will notify you within two hours to let you know if your item list matches the contents. Used Jewelry Buyer LLC relies on the honesty of our customers but we do understand that you may not know the value or quality of your items. We do not accept reasonability for inaccurate listing of your items and will rely on the video record and initial analysis of your items. Please include your personal information and item list with your shipment. Used Jewelry Buyer LLC video records the opening of all inbound shipments. Within 24 hours of receipt of your items we will make an offer to purchase them. If you send many items we will make an offer for each piece or the whole lot. You can sell all your items or only some of them, it’s up to you. We will in no way pressure you to sell something you are unsure you really want to sell. It’s our job to advise you on the best options, and once we both agree (and you have been paid) we cannot undo the transaction. The most we are out is a small insurance fee and shipping costs if you decide not sell your items. Items you do not want to sell will be returned within 48 hours by registered mail. If we come to an agreement on purchasing your items same day payment will be arranged. There are multiple ways we offer to pay you. Overnight check by Fed-Ex is our preferred method of payment. If time is a factor and we have your bank account information, we can wire funds for amounts over $2,000.00. If we are purchasing only part of your items and sending some back we will include a check with the returned items. By filling out and signing the personal information and item list you are stating that you are the sole and rightful owner of the property with full authority to sell or transfer ownership of the items. If you are acting as an agent or representative to an estate, trust, third party seller or ownership group of any kind full legal proof of authority to transfer ownership of the property will be required. 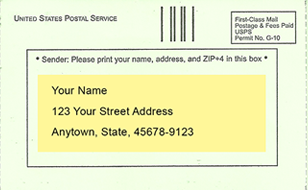 If you mail us worthless items we will send them back to you by padded envelope through regular mail with no insurance. We will not pay for insured registered mail for worthless items. It will be determined at the time we open your package and video the contents if you have valuable or worthless items. If it is determined that your items are worthless we will contact you within 24 hours to let you know we will be sending them back. Used Jewelry Buyer LLC accepts no liability on any item that has no value while in our possession or during the return to the seller.